As the Dunlop Masters Superbike Championship builds to its climax, three more rounds of the championship will be decided this weekend, Saturday and Sunday August 25th & 26th, on Mondello Park's International Track. The penultimate round of the series will also include Motorycling Ireland's Southern Star awards which will be presented to the winner of the final race of the weekend for each class. With the Masters championship being contest at all Mondello Park events this season, Motorcycling Ireland's Short Circuit committee decided not to present their annual awards to the Masters championship winners, but instead to give out their Southern Star awards for a one off race for each class. That one-off race will be the final race for each championship this coming weekend, so the winner of the chosen race will effectively be the 2018 Motorcycling Ireland champion. Yamaha R1 rider Richie Ryan is the man most likely to lift the additional award in the Superbike class as he has dominated the top step of the podium since round five, giving him eleven victories in a row and taking him to the top of the table for most victories at the Masters since the championship began in 2010. Looking to steal the honour away from him will be Peter Moloney and Luke Johnston on BMW's, James Kelly on a Suzuki, a second Yamaha for Edward Comerford and the lone Kawasaki in contention, ridden by Andrew Murphy. The Superbike Cup battle is impossible to call as more than half a dozen riders are capable of coming out on top. The Supersport battle will more than likely be between Yamaha mounted Emmet O'Grady, championship leader Dean McMaster with his Triumph, Raymond Casey's Kawasaki and a second Triumph ridden by Keelim Ryan, who is also the main Supersport Cup contender. In the Cup, Kevin Baker and Eoin Collins, both 2018 Young Racer of the Year nominees will be out to topple Ryan from the top of the podium, but will have their work cut out, such has been Ryan's pace all season. 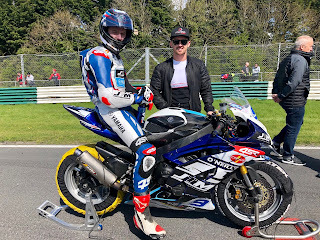 All of the information on the penultimate Dunlop Masters Superbike Championship event of the season, including the timetable, is available from www.masterssuperbike.ie. Tickets are also available to book on-line at the reduced price of just €12.50, with under sixteen's admitted free.